Makes a large dish which will serve 8 people generously. 2. 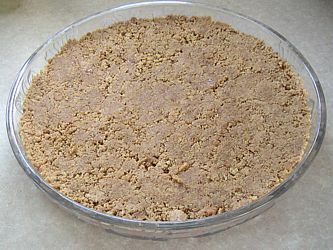 Put into a bowl, add the margarine or butter and blend in with fingers until mixture resembles crumbs. 3. Add the golden syrup and mix with a spoon until evenly combined. 4. Put into the flan dish and press into the base with the back of a spoon to flatten. 5. Put the soft cream cheese into a bowl, add the icing sugar and vanilla essence and mix with a spoon until thoroughly combined. 6. Whip the cream and add to the cheese mixture, folding it in until it is thoroughly mixed in. Pile on top of the crumb base, leaving a slight gap around the edge. 7. 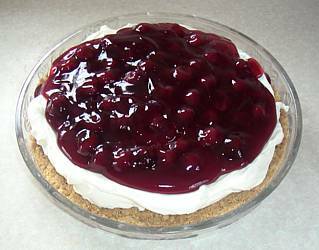 Top with the cherry pie filling, and refrigerate for a few hours before serving to set the base and to allow the flavours to mellow.